Re: Soldiers of Valhalla-TAKING NOMINATIONS! Does the sculpt have to be an original sculpt or can it be a reused Heroscape sculpt? No it does not have to be a original sculpt, since the game already has re-paints we decided that they would be OK. Does it have to be repainted to be eligible for nomination? What do you mean? Why would you use a HS figure that was not re-painted to represent a different unit? How would you differentiate them? Could you PM me an example, so we do not clutter the Nomination thread. My suggestion to nominate "one or more" was not intended to encourage 5 in a post. As far as I've noticed, nobody goes to the BoV and nominates 5 maps at once. Even Dignan's maps only go in one at a time. Another preliminary remark: Speaking for myself, and maybe yes maybe not for the other judges, I am looking for something significantly different from many of the fine customs I've seen on these boards. I want to review units that are *balanced* and *thematic* and have *balanced costs. * Also they need to be playable not just for you, customs creator, and your friends, but for me and my friends and for the various 'Scapers around the globe. Not just for fun, casual play, but for tournament play. Many of the fine customs around the site, like Therrian's Nightwalker and Bodaks, look outstanding and bring new flavor to the game. But that does not mean they are necessarily ready to withstand the rigors of, say, two 11 year olds trying to understand the card, or one guy nonchalantly passing it to his opponent at a tournament and the TD has to come over to try to decipher the 1,000 conditions on the activation of Giant Evil Ray Gun Death Lazer Mini Explosion Quasi Special Attack. Asmodeus: Interesting combination of powers. Seems almost like a melee version of Me Burq Sa, which could explain his 50 point cost. I am troubled by a couple things. The venom counters, intended to last beyond the loss of Asmodeus (or not? wording is not clear), seem very powerful, particularly with the 25% chance to prevent defense dice from being rolled. I have my doubts about the amount of playtesting done at this point cost, frankly. Also, and this may just be me, "Asmodeus" is not some randomly generated name pulled from a hat. It's an old, old name for the "King of Demons," though I first recognized it from AD&D as the name of the Lord of the Nine Hells. It just doesn't seem right to give a name like that to a height 3 snake, like giving "Charlemagne" to Finn. Just doesn't seem right. No to Asmodeus. 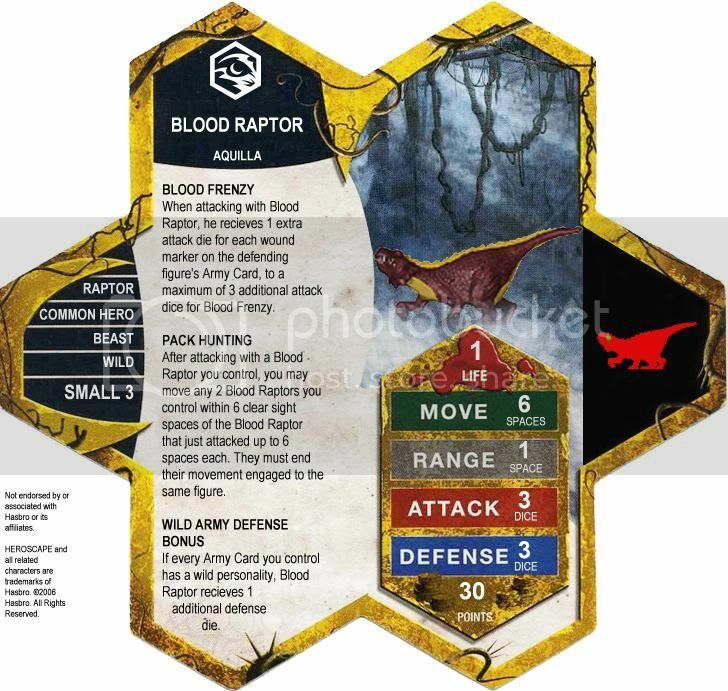 I'll have to give some thought to the Blood Raptors. It appears to me that they can only attack once per OM, it's a movement bonding thing they have going on. You list them as a Small 3; I suppose that means they are small and fit on a single hex base. I'll come back to this one later but I am concerned about its cost. Very thematic. I like the multi-explosion special attack for a powerful dragon. How big is the sculpt? I thought we've seen images of this sculpt elsewhere on the forum and it's wyrmling-size. Regardless, combining the reflective scales and the multi-special attack with a 5/4 flyer with 6 move and 6 life seems like a lot of muscle for 145 points. No to Gordyrr. I'll come back to the other two & the Blood Raptors another time. This has taken longer than I expected. Fetid does need a bit of rewording but I think he's relatively well balanced, can be a pain in melee but he can only hit one thing at a time and dies easy enough from range. Edit: Never mind its a Hezrou figure from the Angelfire Series. Yeah its the D&D Minis Hezrou, this is the Angelfire one but there is a newer version in Legendary Evils as well that could be used. Both aren't too hard to come by. I've always loved the look of the figure. Ok, time to wrap these up. Undercosted. No to the Blood Raptor. I do like the idea of common heroes that work with each other, that keeps some of the theme of squad play without needing the multiple sculpts. Swarm Gruts - A NEW ORC SQUAD, and all you need is BLADE GRUTS! Haze of Madness is interesting. 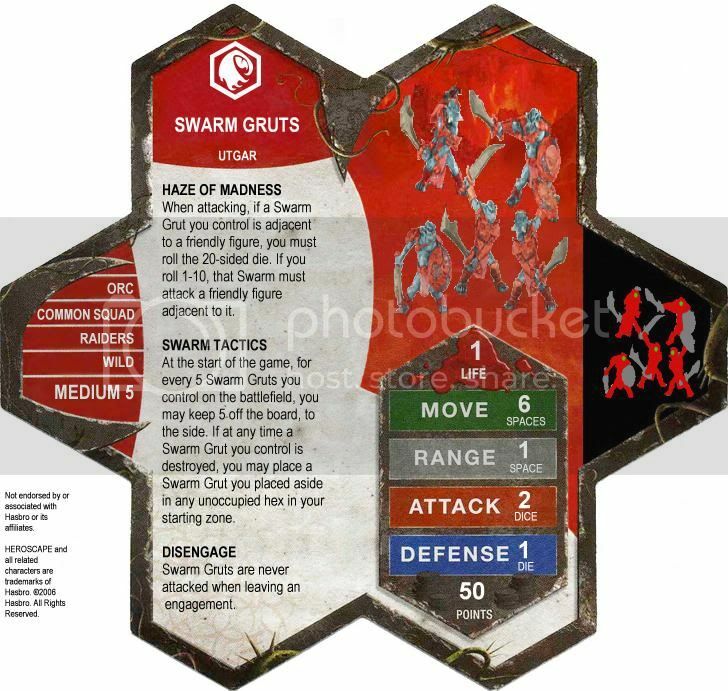 But to make one squad of these you would need to give up two squads of Blade Gruts, and I don't think you'd want fewer than 6 squads of Swarmgruts, the way they're designed. Which would be 12 squads of Blade Gruts. No to Swarm Gruts. 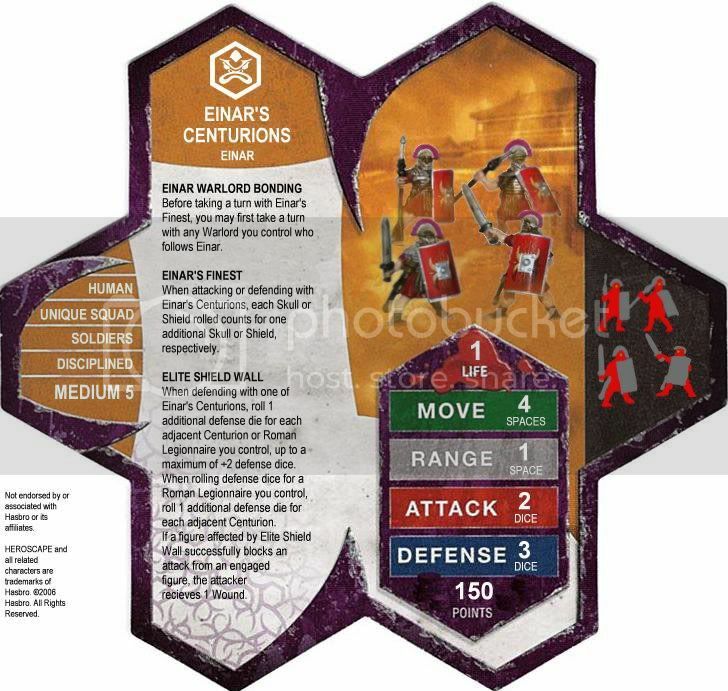 Einar's Centurions, their playability is an enigma to me at the moment, but it sounds like fun, just sub in a squad of Romans! No thanks, not taking a knife to my Romans and 4x Marcus (is that whose head that is?). They have other problems, too, but I do like the presentation of a unique squad. No to Einar's Centurions. Very interesting unit. Very interesting. I vote yes to review & I'm looking forward to playtesting. I have a hunch he will be lots of fun but not be a tourney-type unit, which of course is fine with me. As with many of the others I am curious to know the size of the actual mini. Rob, you don't have a picture of him in action, do you?